Back on April 1st, when the Archivist character was “revealed’ and a good laugh was had by all, there were some fans who noticed and wondered who was the female NPC speaking to Cain in the mock dialogue tree screenshot. 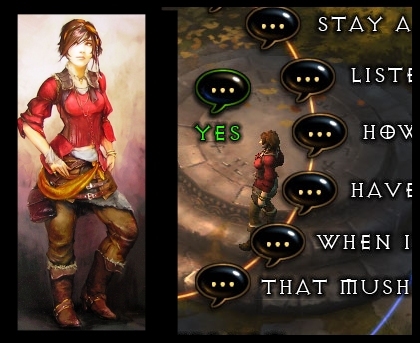 We guessed that it was Leah, previously seen in the D3 introductory cinematic, but there was no way to know for sure. We do now, since as KnightWolf points out, the NPC in that screenshot is clearly the same woman as the one in the Leah concept art from the Blizzcon Art Museum. The side by side comparison in the image below makes it fairly inarguable.